Humorously, comedian and animated comedy creator Seth MacFarlane seems to be a pretty big fan of popping up in other animated comedies not created by him. Recently, MacFarlane popped up in an episode of The Simpsons playing a man pursuing Marge. Now, Comedy Central has announced that MacFarlane will also be lending his voice to one of the show’s final season episodes. EW got the scoop, also nabbing a still of the upcoming Futurama episode, which can be viewed in full size on the site. 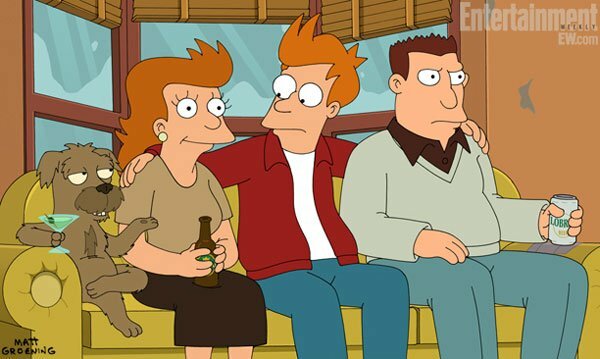 In the image we can see Fry, his girlfriend from the 20th century, Michelle (Sarah Silverman), and a couple of other characters. Of course, the outlet is reporting that MacFarlane will voice the dog character, Seymour, who popped up in another episode back in 2002 and was teased in a recent network Facebook post for the new season. EW interviewed Futurama executive producer David X. Cohen and got more of the details regarding MacFarlane’s appearance and the character he will portray. No matter which character he will play, MacFarlane should be a good fit for Futurama’s Season 7, which will be chock full of other guest stars, as well. Notably MacFarlane’s ex-girlfriend and Game of Thrones star Emilia Clarke is set to show up in the show’s penultimate episode as a flower stand owner who may have an unlikely romance with Zoidberg. Other guest stars include Larry Bird, George Takei, Adam West and more. Comedy Central opted to cancel Futurama all the way back in April, after the show dropped from a decent 2.6 million total viewers in 2010 to well under 2 million total viewers during the past season. Luckily, the network is still allowing the latter 13 episodes of Futurama to air and fans won’t have to wait for a DVD release to catch ‘em. The latter half of Season 7, or Season 7B, will actually premiere tonight on Comedy Central at 10 p.m. ET, so if you have a DVR remote handy, don’t forget to tape it. This really is probably your last chance to catch new episodes of the series, unless the unlikely happens and it gets revived, again. Comedy Central may have cancelled its long-running series, but the network has still put some effort into promoting the show’s last set of episodes. You can check out a clip from the new season, below.